SlewLeo APHA 600,177 - a.k.a. Charley Horse, is a beautiful golden buckskin overo stallion sired by Rocks Baldy and out of a 16+ hand Thoroughbred grand-daughter of the legendary Seattle Slew. He was born at 10:12 PM CST on Monday April 10, 2000. He stood 43 inches tall and weighed 125 pounds at birth. CHARLEY HORSE has moved to Buellton, California !!! Thank You, Theresa and Worley's Hauling for getting him there safely. Click on the names in the 4th generation to see that horses's pedigree. 6 Starts at 3 & 4. Placed once $1872. Sired 530 TB foals, 339 starters, 241 Winners. Total earned $9,693,495. 1 AAA; 4 AA; 2 Performance ROM. 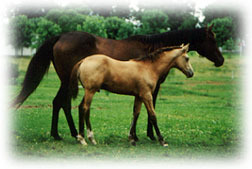 Produced 7 foals; 6 starters; 5 Stakes Placed. 10 Starts, 5 Wins in Argentina; 402,500 pesos. Imported in 1976; 30 Starts, 7 Wins at 4 & 5; $127,905. See his full sister !!!! In June 2007 I received word that Charley had been sold. He was still in California and being shown in US Eventing Assoc. events under the names Solstice and Solstice III. He's apparently doing pretty well. Here are the USEA records. I have seen some beautiful photos of Charley in action, over fences and in dressage. Hopefully I can get some soon to post on this page.